Discover a tropical oasis of island tranquility at the luxurious Hyatt Siesta Key Beach resort located only minutes away from Sarasota’s art and cultural offerings. Whether you’re in search of relaxation, fine shopping and cultural options, or endless adventures in one of the most beautiful settings known to man, you’ll find innumerable activities for you and the entire family in Siesta Key. Grab a bike or kayak from the concierge and head off for an afternoon of discovery. Enjoy world-class golfing or hop onboard a charter boat for a day of fishing the Gulf waters. The activities to enjoy here are as memorable as the sunsets, but don’t forget to dip your toes in the fine, white sands of Crescent Beach just outside the door of your Hyatt Siesta Key Beach timeshare resale. Rated by Dr. Beach as the #1 beach in all of America, Siesta Key’s own Crescent Beach is the perfect place to watch the area’s dolphins frolic in the warm, crystal clear waters of the Gulf of Mexico or simply relax and feel your worries slip away. At Hyatt Siesta Key Beach timeshare resales, you’ll discover the most luxurious beachfront accommodations on Siesta Key. The grandeur of the resort’s spacious condos must be seen to believe. With 13 distinctive floor plans ranging from a sprawling 1,800 to 3,000 square feet, Hyatt Siesta Key Beach fractional ownership properties feature multiple bedrooms that are ideal for family vacations or entertaining guests. Each condo is well-appointed with five–star amenities including large kitchens fully-equipped with Wolf or Sub Zero appliances, multi-head rain showers and oversized jetted bathtubs, flat screen TVs, luxurious king-sized beds, and Bose sound systems. At the Hyatt Siesta Key Beach timeshares for sale, everything you could ever want is right at your fingertips. For ultimate relaxation, escape to one of the spacious poolside cabanas while you snack on gourmet foods and sip refreshing cocktails served up by the Cabana Cantina. After taking in one of Siesta Key’s famous sunsets, enjoy some s’mores around the beachside fire pit or dive in the pool and enjoy a swim-up movie. When you buy a Hyatt Siesta Key timeshare resale, the pampering begins as soon as you check in. The concierge will have your refrigerator stocked before you arrive, allowing you to drop off your bags, take a walk on the finest sand you have ever felt, and then spend an afternoon of relaxation at the resort’s rejuvenating Hollywood Spa. If you need to book a tee time at one of the area’s famed golf courses, a dinner reservation at one of Sarasota’s esteemed restaurants, or anything else at all, the concierge is just a phone call away. Only a short bike ride away from Siesta Key, Sarasota is renowned for its shopping and cultural activities. Spend the day admiring beautiful works of art at the Art Center Sarasota, take in a musical or concert at the Ven Wezel Performing Arts Hall, enjoy symphonic sounds at the Sarasota Opera, or experience classical ballet by Sarasota’s travelling troupe of highly-skilled ballet dancers at Sarasota Ballet. Between events, you can peruse the Towels Court Art District, where you can shop and dine in the charming historic arts district of downtown Sarasota, or take off to St. Armands Circle to experience a diverse collection of shops and restaurants spanning two bridges over the picturesque Sarasota Bay. By purchasing a luxurious Hyatt Siesta Key Beach timeshare resale, you have the opportunity to enjoy one of the most beautiful landscapes in the world, and along with the hundreds of other keys dotting the turquoise horizon, it is definitely worthy of further discovery. You can grab a bike from the resort’s in-house supply and head out for a day of exploration. If in the mood for a little more adventure, you can snag a kayak from the resort and paddle out to explore the crystal-clear waters and the numerous white sand keys only a short distance away. 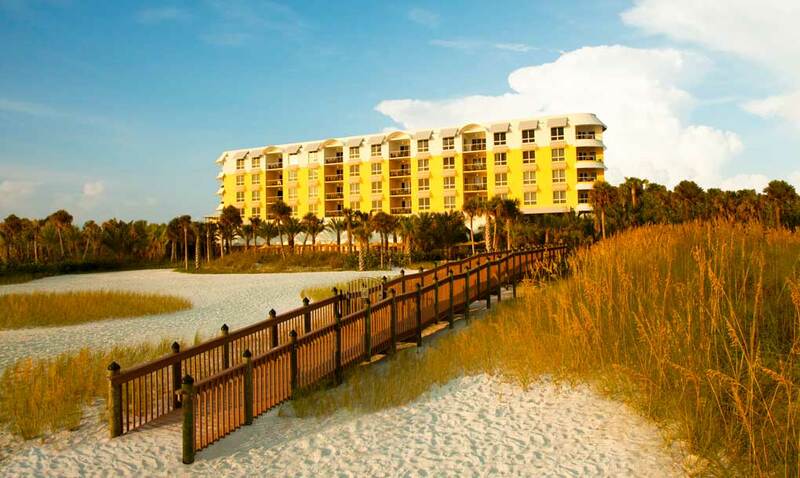 Premier Timeshare Resale has access to myriad Hyatt Siesta Key Beach timeshare deals, allowing you to buy a Hyatt Siesta Key Beach timeshare for a fraction of the cost of staying at a resort. If the need to sell a Hyatt Siesta Key Beach timeshare arises, the experienced agents at Premier Timeshare Resale can help you receive top dollar for your beautiful Siesta Key property, providing another family with vacation bliss year after year.